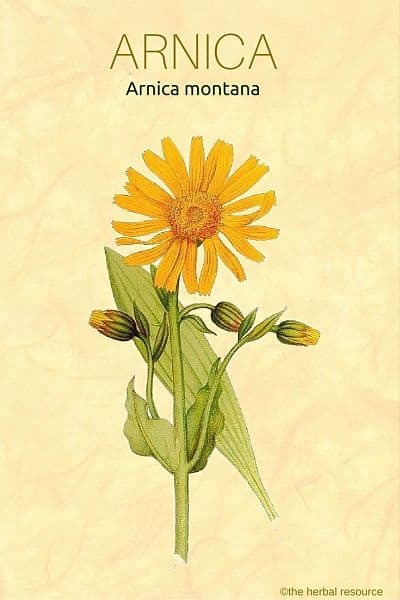 Arnica montanta is a beautiful plant that sadly has become endangered in many places. It has been used in folk medicine for ages, for its ability to speed the healing of tissues and as a remedy for various other ailments. Today the plant is widely known and in recent years it has become a very popular herb around the world, particularly in Europe. The herb is rarely used as a herbal tea but rather in tincture, ointment, gel, oil and homeopathic form. What is Arnica Montana Used For? 1 What is Arnica Montana Used For? Arnica is applied to the skin for pain and swelling associated with bruises, aches, and sprains. It is also used on the skin to treat insect bites, arthritis, muscle and cartilage pain, chapped lips, and acne. 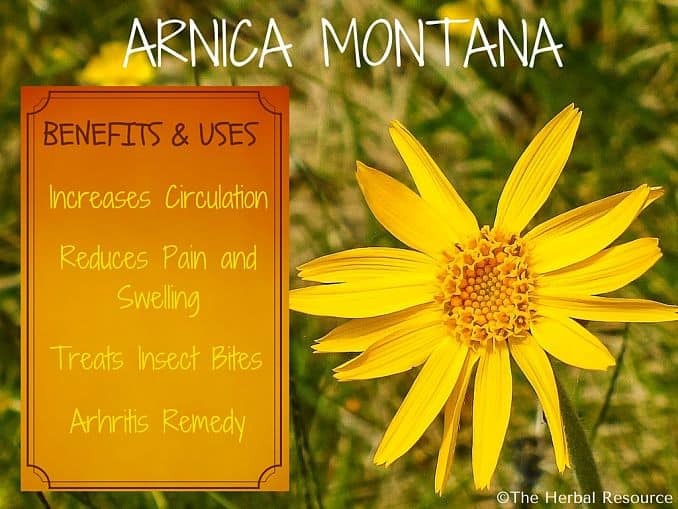 Arnica montana is widely held to improve blood circulation, allowing oxygen to get to the cell faster. Used topically, Arnica Montana is touted as a great way to speed the healing of bruises and sprains, and it is used as an alternative treatment in sports-related injuries of this type. 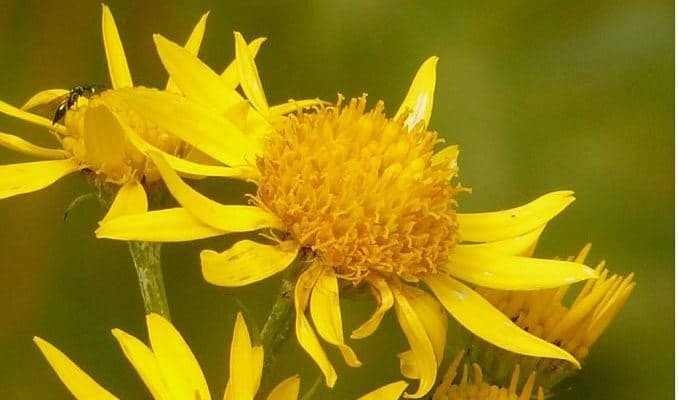 Arnica Montana acts as an anti-inflammatory and has even been indicated as a way to speed the absorption of internal bleeding back into the body. Preparations made from the plant are often thought of as a preferential treatment for leg ulcers in diabetic patients. Arnica Montana is thought to be an effective herbal treatment for bacterial infections, including salmonella and listeria. Comprehensive testing has not been performed to prove or disprove this. In folk medicine, the herb has been used for a migraine and tension headaches. It has recognized sedative effects that relieve pain, and relax muscles. Diluted arnica packs may be applied to an abscess, reducing swelling, and speeding up the absorption of toxins and allowing tissue to heal quickly. Applied topically to the unbroken skin, arnica patches relieve pain, similar to commercial pain patches. The plant contains bitter substances, essential oils, quinones, helenalin, tannins, inulin, and choline. The flowers contain a high amount of flavones and other substances. The substance helenaline stimulates the heart and respiration in small doses while lowering blood pressure. It is also an allergen that can cause skin inflammation in some people. All parts of the plant are used in herbal medicine (leaves, root, flowers). The flowers are collected as soon as the plant blooms and the roots (rhizomes) are dug up in the fall when the plant has withered. The flowers are dried at 40-45 ° C and the roots at 70 ° C.
Arnica is rarely administered in a pure form. Instead, tinctures or oil are prepared which can then be used as the basis when creating other treatment methods, such as creams and gels. According to some folk medicinal uses, it is regarded to be effective in preventing various diseases by taking it at the first indication of illness. Extract: Add one tablespoon (about 2 g) of the dried or fresh flowers to 1 dl of boiling water. Strain for 5-10 minutes. The extract can then be used as a wrap or as a gargle. Tincture: Add 30 g (1 ounce) of the dried flower preserved in 30 ml (8 fluid ounces) of food grade alcohol. Oil: Use one part of the flowers to every five parts olive oil. For all commercial products containing arnica montana, be it creams, gels, ointments or tinctures, the manufacturers’ instructions should always be followed. Arnica montana should never be used internally unless in homeopathic form. The herb should not be used on open sores or wounds. 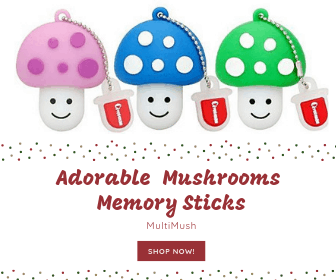 Nor should it be used extensively for a prolonged time as it may cause inflammatory reactions in the skin, edema, bladder or allergic condition. Excessive use must be terminated immediately upon signs of any skin reactions. Pregnant and breastfeeding women should consult a professional healthcare provider before using the herb externally. Poisoning has occurred after ingestion of large doses of alcohol extracts of the plant. If taken internally, arnica montana can cause dizziness, tremors, and heart irregularities. Other possible side effects may include vomiting, muscle weakness, and an increased risk of bleeding. In the case of arnica poisoning the treatment can consists of gastric lavage (stomach pumping), activated charcoal and symptomatic treatment. Leopard’s bane, common arnica, mountain daisy, wolfsbane, mountain tobacco, fleurs d’arnica (French), almindelig guldblomme (Danish), slåttergubbe (Swedish), Arnika (German). Arnica grows around the world in subarctic zones. It is found from Europe to Siberia, in the Pyrenees, and throughout Canada and northern sections of the United States. Arnica montana has been over-exploited in the wild and is now considered an endangered species in most areas. Therefore, the plant material should not be collected from the few growing places the plant still can be found in, but instead, be obtained from cultivated plants. The arnica grows a rosette of leaves which may reach 5-8 cm in length. The flowers are yellow or orange, with approximately 11 petals arranged the central flower. Atkins, Rosie, et al. : Herbs. The Essential Guide for a Modern World. London, Rodale International Ltd. 2006. Blumenthal, Mark: Herbal Medicine. Expanded Commision E Monographs. Austin, Texas, American Botanical Council 2000. Foster, Steven & Varro E. Tyler: Tyler’s Honest Herbal. A Sensible Guide to the Use of Herbs and Related Remedies. Fourth edition. New York & London, The Haworth Herbal Press 1999. Mills, Simon & Kerry Bone: Principles and Practice of Phytotherapy. London, Churchill Livingstone 2000. Mills, Simon & Kerry Bone: The Essential Guide to Herbal Safety. St. Louis, Elsevier 2005. Treben, Maria: Health from God’s Garden. Rochester, Thorsons Publishing Group 1987. Please be careful using Arnica montana in ANY oral preparation. I have never had any allergies,or so I thought. I was given Arnica pastilles to take orally after a dental procedure. I followed the package dosage but had a very unpleasant allergic reaction after only 1 dose. Intense itching on the palms of my hands and soles of my feet and hives all over followed. From now on I will always do a skin test to see if I react to an herbal preparation. That said I don’t know if a skin test would have caused any reaction that would have predicted how I would react with an oral prep. I am an avid gardener an have been gardening since I was a child with my mom. I guess I never encountered this plant before. Amazing I am not even allergic to poison ivy! I have hypertension and took the Arnica 30X. I checked with a DR before taking this and during a 2 week period I had dizziness, vomiting, diarrhea, heart palpitation, increased blood pressure and heart palpitations. After 2 weeks I passed out and do not remember any details. I ended up in the hospital for fluids. Be careful!